Our friends hosted a Cuban dinner party this past weekend. It was really fun to experiment with a couple of new recipes. Everyone was assigned a dish to bring for the meal and I chose this light and summery avocado and pineapple salad and a baked flan for dessert. While searching for authentic Cuban recipes, this little gem popped up from Three Guys From Miami. I mean, how could I go wrong with a Saveur recommended site and three Cuban chefs?! This simple salad is a fantastic sweet/savory combo and perfect for a summer afternoon. Make it even more amazing by juicing fresh oranges for the dressing. Salad perfection. Combine olive oil, vinegar, orange juice, and sugar in a blender until smooth. Add salt and pepper to this mixture to taste. 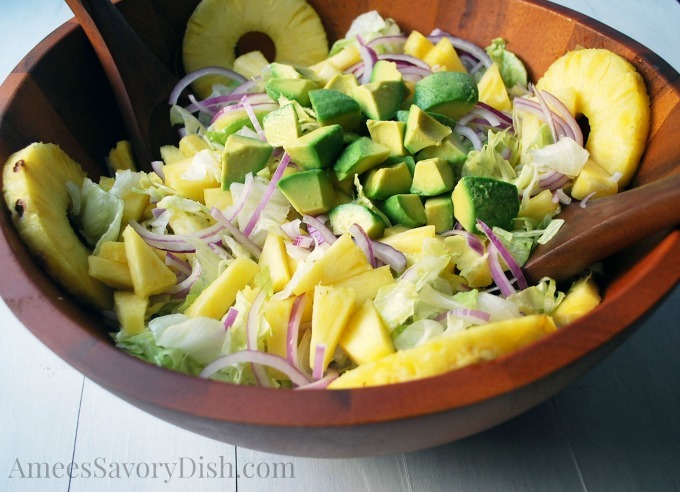 Lightly toss the lettuce, pineapple, and red onion together. Pour on the oil and vinegar mixture until everything is well coated. Adjust the amount used to your own preference, more or less. Garnish individual salads with several avocado slices lightly seasoned with salt and pepper and a squeeze of lime juice. This is perfect for those summer cook outs! I love the freshness of this Avocado salad, it sounds so delicious. Thanks so much for sharing with Foodie Friends Friday party this weekend. Will pin/share. I definitely need to add some pineapple into my salads. This looks so refreshing, tropical and delicious! I love it! So fan of adding pineapple to salads!